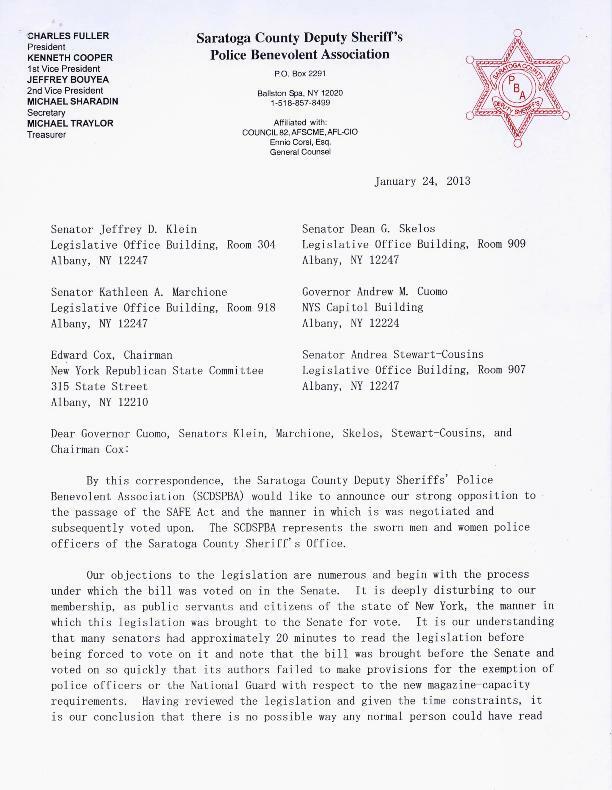 By this correspondence, the Saratoga County Deputy Sheriffs’ Pol ice Benevolent Association (SCDSPBA) would like to announce our strong opposition to the passage of the SAFE Act and the manner in which is was negotiated and subsequently voted upon. The SCDSPBA represents the sworn men and women police officers of the Saratoga County Sheriff’ s Office. Our objections to the legislation are numerous and begin with the process under which the bill was voted on in the Senate. It is deeply disturbing to our membership, as public servants and citizens of the state of New York. the manner in which this legislation was brought to the Senate for vote. It is our understanding that many senators had approximately 20 minutes to read the legislation before being forced to vote on it and note that the bill was brought before the Senate and voted on so quickly that its authors failed to make provisions for the exemption of police officers or the National Guard with respect to the new magazine-capacity requirements. Having reviewed the legislation and given the time constraints, it is our conclusion that there is no possible way any normal person could have read the entire bill and understood its implications prior to voting on it. They most certainly could not have requested and received the input of their constituency and considered their opinions in the matter – which is the most basic tenet of a representative government. The entire process was one of secrecy and of intentional withholding of information from the public. We condemn this in the harshest terns. Had there been an opportunity for the public to exercise their right to be involved in the legislative process prior to the bill being voted upon, we would have offered a letter of opposition. Instead, we find ourselves in the rather unique position of opposing legislation after it has been passed. Our membership believes we were denied one of the nest basic rights of a democracy by this process and we cannot and will not accept this type of behavior from our elected officials. In our opinion. there was absolutely no reason for the Governor to use a message of necessity to bring this bill to vote. We note that the Governor has used the message of necessity 35 times since taking office and for nearly every major piece of legislation he has sought to pass. This particular bill has 56 sections; 53 take effect in 60 days, 2 take effect in 1 year and 1 section, which requires owners of certain firearms to register them within l year, takes effect immediately. In other words, given the language of the bill itself, there is no emergency. As the message of necessity is to be used solely in the case of a true emergency that warrants the waiver of the 3 day maturing process for all legislation, the Governor’s actions were questionable at best and a deliberate attempt to bypass the Constitutional process and thus opposition to the bill at worst. The evidence strongly suggests the latter. The Senate Leadership also had a responsibility to negotiate this legislation publicly and to call the Governor out on his excessive use of the message of necessity. Unfortunately, they chose not to do either, thus depriving approximately 19.5 million citizens the opportunity to offer meaningful comments and criticisms of the bill, and to exercise their rights under our system of government. In short, the Senate Leadership allowed the Governor to force legislation upon the citizens of our state. Instead of offering a check-and-balance against the Executive Branch. the Senate Leadership condoned and authorized what may fairly be described as ruling by fiat. Whether one is for or against the new legislation, all citizens should be truly concerned by the manner in which our allegedly representative government behaved and we condemn this in the harshest terms. As a predominantly rural county in upstate New York, the lawful ownership of firearms is and has been a valued tradition enjoyed by many of our citizens. Sadly, the legislation effectively turns countless law—abiding gun owners into criminals for absolutely no reason. Many of our membership are gun-owners and have gone through the same licensing process as non~police officers and it is our belief that this process has served our citizens well. Mandating law-abiding gun owners to now have to register certain types of firearms on~a yearly basis, in addition to registering them on their permits (which now must be renewed every 5 years), accomplishes nothing in the area of public safety and is unnecessarily burdensome to a citizen who has done nothing but abide by the laws of our state. The SCSDPBA reminds addressees that “assault weapons”, which are banned under the new legislation if they have 1 military-type feature, were responsible for 5 out of 769 homicides in New York last year – or .007% – hardly a public safety crisis for our state. The Albany County District Attorney’s Office prosecuted 4 cases involving assault weapons last year – none of which involved their use in the commission of a crime – and a recent FBI report showed that hammers and clubs were responsible for more deaths than rifles and shotguns. Given the foregoing, our membership questions why there was a need to ban the lawful use, possession, and sale of these firearms at all . Again, many citizens of our county previously enjoyed the use of these rifles for activities such as hunting and target shooting, and are now being forced to register these firearms, on a yearly basis, when they have done nothing wrong. In addition, any semi-automatic pistol that has 1 “military—type” feature will, under the new law, be considered an assault weapon. While it may come as a surprise to the authors of the legislation, most semi-automatic pistols do in fact come with a pistol grin. making nearly every semi—automatic pistol an assault weapon and thus subject to registration on a yearly basis. This registration is in addition to registering the pistol on one’s pistol license every 5 years. The SCDSPBA believes this is absurd, serves no public safety interest in the slightest, and crosses the proverbial line from reasonable restrictions on gun ownership to outright harassment of law-abiding gun owners. As police officers who encounter criminal activity on a daily basis, our membership finds the notion that a criminal might somehow wait in line to turn in his or her high-capacity magazines or sell them to someone out-of-state to be so ridiculous as to be not based in reality. It is beyond shocking that a member of a body entrusted to legislate the very laws that govern our society could, with a straight face, argue this point. Our membership believes, as do most people of sound mind, that the only persons who will abide by the new high—capacity magazine ban are the law—abiding, leaving the same high-capacity magazines in the hands of those who choose not to obey the law. Additionally, from an ethical and moral standpoint, we question why, if high-capacity magazines are as destructive and deadly as the legislature contends, they could be allowed to be sold to someone out-of—state. Certainly, they would be as dangerous in New Jersey as they would be in New York. Since 85 to 90% of guns used in crimes in New York originate from out-of-state, it is nothing short of incredible to us that the authors of this legislation could not have foreseen the possibility of these magazines finding their way back into New York. However this is the proposed solution offered by our elected officials, for which we can find no discernible logic. While there are some areas of the legislation that the union finds encouraging, such as addressing glaring shortcomings in the mental health system by-and-large, our membership finds the legislation to be little more than a thinly-veiled attempt at regulating lawful gun ownership out of existence. From the manner in which the legislation was negotiated in secret, to the fashion in which it was brought to the Senate floor for vote, there was nothing about the process that was transparent or that took into consideration what cannot be disputed – that law-abiding gun owners are not and have not been the source of criminal activity. The legislation fails miserably to offer any meaningful solutions to the epidemic of gun violence and places the blame squarely where it does not belong – on the shoulders of law-abiding citizens. One need look no further than the embarrassment of New York’s Combined Ballistic Identification System that devoured $44 million in taxpayer money over 11 years to regulate lawful gun—ownership and which resulted in no convictions of anyone for anything to illustrate the non- complicity of lawful gun—owners in recent events. In recent days, we have also become aware of published reports describing a large and growing movement within our state of citizens who have apparently announced their intention of non—compliance with the new statutes as they relate to assault weapons and registration. With an estimated 1 million assault rifles in existence throughout New York, it is beyond comprehension that the legislature and the Governor would needlessly place police officers in a position where they might be called upon to confiscate the previously lawfully owned property of an American citizen. There can be no denying the potential danger this prospect places law enforcement in and once again strongly suggests a bill that was rushed to passage without forethought or any regard for its potential implications. We cannot excuse this and do not appreciate our very safety being sacrificed for political gain. In conclusion, we would be remiss were we to not mention our outrage at the conduct of the Senate Republican Coalition. Many of our membership contacted Senator Skelos’ office on a regular basis to voice opposition to additional regulations of firearms and were assured that the senator’s office was being flooded with similar calls. We have, in the past, always looked to the Republican party to protect the rights of law-abiding citizens much in the same way we place our lives on the line every day to protect the rights of all citizens. To have them negotiated away in secret and to be stripped of them in a clandestine vote is both appalling and unforgivable. It will most certainly give pause to many of our individual members when considering their voting choices in the future and we condemn this in the strongest possible way. For the foregoing reasons, we cannot offer our support for this legislation. We encourage members of the legislature to hold hearings where the public is afforded the right to participate in the legislative process, to address the issue of gun violence in a way that might actually produce meaningful results, and to stop holding law-abiding citizens who choose to exercise their rights under the Second Amendment hostage for the criminal behavior of another, and the political aspirations of the Governor. This entry was posted in Resolutions, Resolutions opposing and tagged Passed, SaratogaCounty. Bookmark the permalink. As a resident of Saratoga County I am extremely pleased that our sheriffs office has so eloquently described the situation and taken such a stand. Our long time sheriff Jim Bowen is an honorable man, as are the deputies of the department. Thank you all for recognizing this disaster for what it really is. I was born and raised in Upstate New York (Seneca County) by a Chief Deputy Sheriff / gun collector and can only say New York Legislature you shame and embarrass me so badly that 30 years ago I moved to Texas and have been a proud member of the citizenry of Bexar County TX. When I was a child growing up I was taught gun safety and hunters safety by that same man who raised all five of us, 3 sons and 2 daughters, and shared a bond over going to the range and firing, cleaning, caring, and respecting our guns & our rights. Your action is disgusting and deceitful and I can only hope that your voting public (constituents) can recognize it during the next election process. The Reason for this was to say thank you Saratoga County for being good citizens, you have restored some of my faith.